Rammed Earth Flexi-FormTM - Formwork that works! At Rammed Earth Australia Pty Ltd we use our own custom formwork system including our patented Flexi-FormTM formwork for curved rammed earth wall construction. Developed, designed and manufactured by Rammed Earth Australia our unique formwork ensures building with rammed earth can meet any design brief imaginable. Rammed Earth Australia use both straight edge formwork and Flexi-form when we are employed for the construction of rammed earth walls, with each job's formwork customised to ensure quality and productivity. Straight edge formwork is also available to purchase either in pre-designed kit form or by custom order. Interested in a quote for rammed earth construction or formwork? 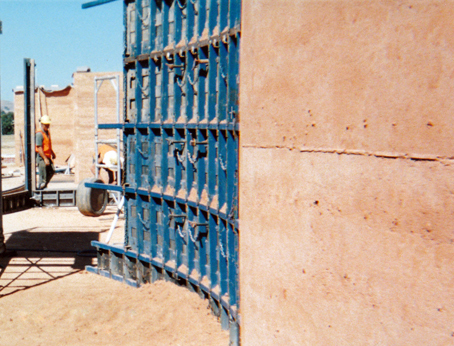 Formwork is an integral part of constructing rammed earth walls. 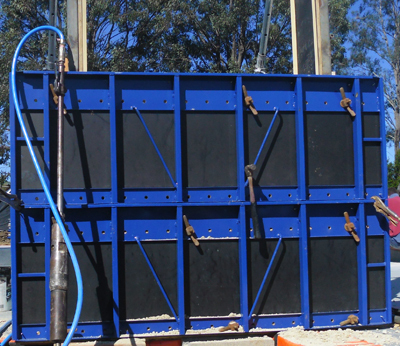 Many factors go into ensuring formwork is right for any given project. If you are an owner builder wanting to construct your own rammed earth walls we now offer 2 pre-designed straight edge formwork kits! Standard Rammed Earth Formwork Kit. Suitable for completing up to 2 wall sections at a time. See package details and pricing Here. Large Rammed Earth Formwork Kit. Suitable for completing up to 5 wall sections at a time. See package details and pricing Here. If you are unsure of your requirements for a rammed earth formwork kit supplying us with your plans will allow us to point you in the right direction and provide you with a quote for a customised kit if the above packages are not quite right. From time to time we have second hand formwork available to purchase. If you are interested in second hand formwork please contact us and we can discuss if the available formwork is right for your project and pricing. For quoting purposes we require detailed plans for any construction you would like us to complete. *Please note that only straight edge formwork can be purchased by owner builders. All curved rammed earth walls using curved Flexi-FormTM formwork must be constructed by Rammed Earth Australia Pty Ltd. There is a minimum six week lead period for formwork orders once any quote we provide has been formally accepted and deposit paid.